No translation required: The new Hindi film appeals to the young, old, rich and poor. It’s the sort of thing that hip young directors such as Karan Johar say all the time—and I agree with them. There was a time, not so long ago, when India was divided into people who saw Hindi movies and those who saw Hollywood movies; between those who listened to rock and those who listened to Hindi film songs. Then, around a decade or so ago, that division blurred. Affluent, English- educated Indians dropped their snobbish notions about Hindi cinema and were able to like Aamir Khan as much as they liked Tom Hanks or Shah Rukh Khan as much as they liked Tom Cruise. The old rock versus filmi distinction collapsed as well. At fancy parties, the only time the dance floor really filled up was when they played Hindi, or even Punjabi, music. Suddenly, Hindi cinema became hip. And elements of Indian pop culture have now expanded to encompass the English-speaking elite. These days, when a new Hindi film—say Chak De! India—is released, everybody wants to go and see it. Nobody says “I’d rather see The Bourne Ultimatum or Ocean’s 13 instead." It’s entirely acceptable to want to see Bollywood and Hollywood films on the same weekend. 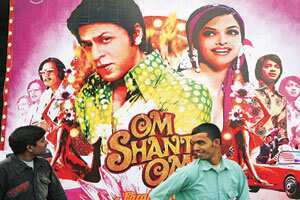 And even when the film is an unabashed, joyous retread of Hindi film clichés and a homage to the movies of the 1970s—say Om Shanti Om—it becomes such a rage that its appeal cuts across all socio-economic groups. The usual answer to this question is an unqualified yes. The strength of pop culture lies in its ability to appeal to us all. We enjoy the songs from KANK and applaud the daring nature of its theme. We laugh at Bheja Fry and we are tickled by some of the gags in Partner. But there is a problem. And I haven’t quite worked out the solution yet. As much as you may have enjoyed Om Shanti Om or even Saawariya, do you watch Kyunki Saas Bhi Kabhi Bahu Thi? When you flip from one Hindi entertainment channel to another, can you really tell the difference? Isn’t there a certain stultifying sameness to the manner in which over-made-up, overdressed women waddle around lurid and garish sets, pausing every five minutes or so for an extreme close-up, accompanied by loud and, frankly, disturbing explosions of music? Do you really find the jokes on the many stand-up comedy shows (spawned by the success of The Great Laughter Challenge) genuinely funny? Can you understand why Navjot Singh Sidhu laughs so hysterically at every weak gag uttered by each aspiring comedian? It’s a strange thing, but even as Hindi cinema has become the great leveller, television has become a world unto itself, carving out a solid constituency in the lower- to middle-middle class (look, I’m sorry if this sounds snobbish, but there’s no other way to say it), while almost completely ignoring the upper-middle class and the elite. The same people who think Aditya Chopra is a genius are less enamoured of Ektaa Kapoor or Dheeraj Kumar, even though their hit shows are directed at the urban middle class. Poonam Saxena, Hindustan Times’ acerbic TV critic, has written that she is astonished by how contemporary Hindi cinema has become while TV seems mired in clichéland. There was a time, till the early 1970s or so, when Hindi cinema stuck to a formula. There was a comedian, a villain, a vamp, an evil mother-in-law and a cabaret dancer. All performances were stagey and predictable and many of the themes were socially regressive. But while Hindi cinema has moved away from that primitive era, TV seems to have taken over that slot. The themes are so regressive that feminist organizations are always complaining. The performances are so over-the-top that it is hard not to giggle at the overacting. The plots are risible, falling back on ancient Hindi movie clichés such as the naagin, the direction is often shoddy and “production values" refer only to costumes and overpainted sets. It’s different in the US. Most of the great hits of US TV tap into a Hollywood sensibility. If you enjoy 24, you’ll probably like the Bourne trilogy. The Sopranos is a wittier variation on the Mafia movies that Hollywood has churned out. And the hit films that, say, Jennifer Aniston has made after Friends (Along Came Polly et cetera) belong to the same basic genre as the TV show that made her reputation. But that’s not true of Indian TV. Can you really see the ethos of Kyunki Saas Bhi Kabhi Bahu Thi being translated to the big screen? And while a few TV actors have made it to the movies over the last decade, Hindi cinema tends not to look at the small screen for talent, reaching out either to star families (the cast of Saawariya) or to modelling (Deepika Padukone in Om Shanti Om) or beauty contests (Priyanka Chopra is one of many Miss Worlds and Miss Universes in Hindi cinema) for new stars. So where does the ethos of Hindi TV come from? Why does it occupy a space that is so completely separate from the world of Hindi cinema? Why do so many of us (readers of Lounge, for instance) thrill to masala Hindi movies while remaining resolutely unmoved by the appeal of the mega-serials that have much of middle India so completely enthralled? And why do the people who watch the Balaji kind of serials in their homes have very different expectations when they go to see a movie made by Sanjay Bhansali or Yash Chopra? Frankly, I am foxed by the phenomenon. It’s one bit of Indian popular culture that leaves me completely mystified. And, I haven’t ever read an explanation for the apparent paradox from anybody else. So till I work that out, I’ll watch Star One for Koffee with Karan and then zap to another channel when the serials come on.